The 34mm Express Card and attached 50 cm DVI like cable are meant to be used in conjunction with the CoolGear CG-PCIePCIx4IPS and CG-PCIX4IPS Expansion boxes expanding PCI/PCIe functionality to laptop computers. Easily connects to the 34mm expansion slot of supporting laptop computers. Includes attached DVI like cable for connection to expansion boxes. PCMCIA ExpressCard expansion box host adapter with 50 cm short cable specifically designed to connect to notebooks or laptops with express card slots. The Express Card connects through your laptop to the expansion box giving the user the ability to use PCI slots where none were available previously. This expresscard and attached cable are designed to fit and function with the CG-PCIX4IPS and CG-PCIePCIx4IPS PCIe to PCI Expansion boxes with built-in power supplies. 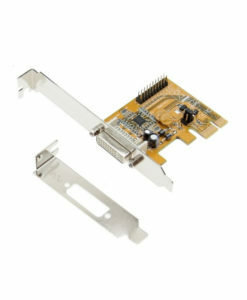 With the same 34mm size and pin assignment, the expresscard is compatible with supporting laptops making the connection to the PCI/PCIe expansion box easy and convenient. Expands to 4 PCI 32-bit 33MHZ slots over PCI Express Slot. Supports 34mm and 54mm Express Card Slots. Supports screw lock mechanism for securing connections to expansion boxes.